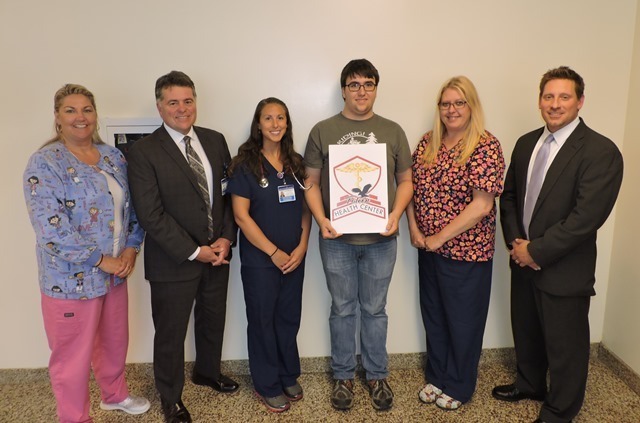 Lowville, N.Y. - Lewis County General Hospital and South Lewis Central School are pleased to unveil a new name and logo for the South Lewis School Based Health Center. The school based health center, which opened in September 2017, will now be called the Falcon Health Center. The Falcon Health Center logo has been in development over the past few months and was designed by Greg Myers, a senior at South Lewis Central School. Mr. Myers attends the Visual Communications class at BOCES Howard G. Sackett Technical Center in Glenfield. According to Mr. Myers, "It was an honor to develop the new logo for my school. I incorporated parts of the South Lewis Central School logo with a few new elements to tie in the health center." The Center serves the health care needs for enrolled students in the South Lewis school district. Care is provided to enrolled students with either insurance billing or with no fee should the pupil not be covered by an insurance plan. The Falcon Health Center is staffed by Kimberly T. Palmowski, RPA-C, and Heather L. Kent, LPN and is open Monday-Friday from 7:30am-3:30pm while school is in session. "While hospital staff provide care at the school based health center; we wanted to make the health center's identity part of South Lewis Central School," stated Lewis County General Hospital Chief Executive Officer, Gerald R. Cayer, MPH. "This further demonstrates our commitment in partnering with the district, supporting working families and educating the next generation of health care consumers and supporting and providing access to care." The Center provides: diagnosis and treatment for acute illness and injury, immunizations, allergy injections, comprehensive physical exams, sports physicals, mental health, laboratory testing, management and monitoring of chronic health conditions, and nutrition services. "We work closely with the school nurse and the student's family doctor to improve access to care and meet the health needs of students, stated Physician Assistant Kimberly Palmowski, RPA-C. "We accept walk-ins and same-day appointments, and parents may bring their children to the school clinic even if they keep them home sick for the day." According to South Lewis Central School Superintendent Douglas E. Premo, "Over 500 or approximately 50 percent of student population are now enrolled at the health center. The availability and access to care has had an impact on absenteeism and the health of our students." For more information regarding services or enrollment, please call the Falcon Health Center at 315-348-2585.